With a stay at Freehand Los Angeles, you'll be centrally located in Los Angeles, just a 4-minute walk from Orpheum Theatre and 6 minutes by foot from Pershing Square. This 4-star hotel is 0.3 mi (0.5 km) from Fashion District and 0.7 mi (1.1 km) from Grammy Museum. 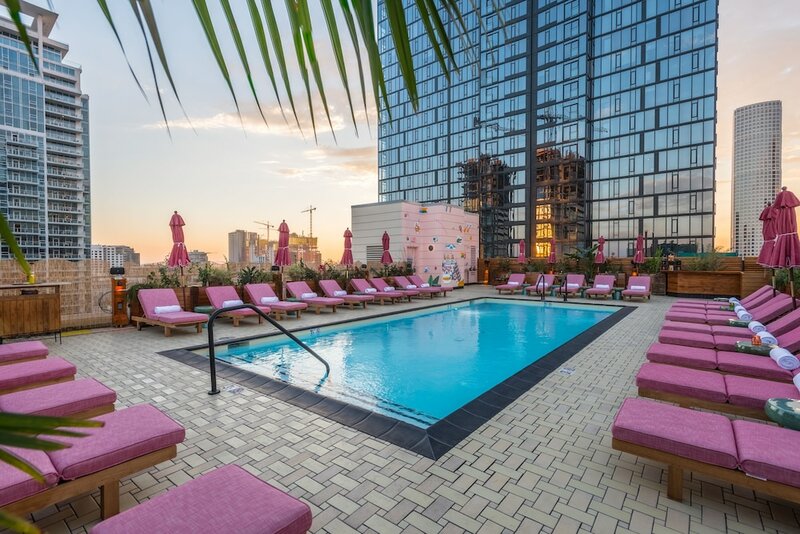 Freehand Los Angeles features an outdoor pool and a 24-hour fitness center. Dining is available at one of the hotel's 3 restaurants and guests can grab coffee at the coffee shop/café. The property also has a snack bar/deli. Guests can unwind with a drink at one of the hotel's bars, which include 2 bars/lounges and a poolside bar. Guests can enjoy a complimentary manager's reception on select days. Public areas are equipped with complimentary wireless Internet access. Business-related amenities at this 4-star property consist of a business center and a meeting room. This Beaux Arts hotel also offers a rooftop terrace, tour/ticket assistance, and multilingual staff. Parking is available onsite for a surcharge. A total renovation of this property was completed in June 2017. Freehand Los Angeles is a smoke-free property. The Exchange Restaurant - This restaurant specializes in local and international cuisine and serves breakfast, brunch, lunch, and dinner. Guests can enjoy drinks at the bar. Open daily. Broken Shaker - This poolside rooftop bar specializes in local cuisine and serves brunch, lunch, dinner, and light fare. Guests can enjoy alfresco dining (weather permitting). Happy hour is offered. Open daily. Rudolph's Bar & Tea - This lobby lounge specializes in local and international cuisine and serves lunch, dinner, and light fare. Happy hour is offered. Open daily. Cafe Integral - This Cafe specializes in local cuisine and serves breakfast and light fare. Open daily. Reservations are required for massage services and spa treatments. Reservations can be made by contacting the hotel prior to arrival, using the contact information on the booking confirmation. The property allows pets in specific rooms only and has other pet restrictions (surcharges apply and can be found in the Fees section). Guests can arrange to bring pets by contacting the property directly, using the contact information on the booking confirmation.